This scrapbooking idea is a rather fun one. It allows you to take stock of the strategies you rely upon in times of stress and feeling overwhelmed. You know how we are creatures of habits. When the going gets tough, it’s more than likely you have your own unique ways of coping with the situations. Do you run a hot bath and soak yourself in the tub for hours, tuning the world out? Do you call up a few of your favorite shopping pals and go all out to have a great splurge? Do you cast aside your deadlines and work, hit the gym and run on the treadmill till you couldn’t run anymore? 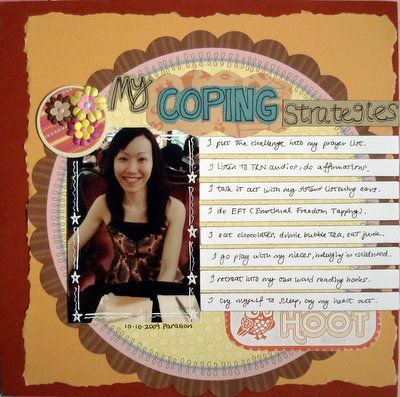 Scrapbook about a few of your time-tested coping strategies. Celebrate these methods through your layout as these are what help you to get through the daily grind and emerge stronger and energized for the next phase. For me, it’s a couple of strategies really. I could be putting it into my prayer list – go play with my nieces to relieve some work stress or monotony – eat chocolates or junk to make myself feel better (oops!) – talk it out with my sisters – retreat into my own world by reading. And others. It’s time for you to have some fun scrapping about your coping strategies! For more scrapbooking page ideas, do take your time to browse through this site. Supplies used: Cardstocks – Bazzill Basics, Patterned papers – My Little Shoebox “Whoo Loves You? – Songbird”, Love Elsie “Jack+Abby Stripe Dot”, Sassafras “Serendipity – Owl Pals”; Chipboard circle – Brenda Pinnick “Chipboard Die Cuts”; Flowers – Prima Marketing; Brads – KCKCraft; White pen – Uniball Signo Broad; Black pen – Zig Memory System “Millennium”; Black ink – Versa Color.